Guys, I’ve added a new step to my skincare routine! And I know you may be wondering, Where do you even have room for a new step? or maybe Do you really need another step? Well, the answer to the second is up for debate, but I wouldn’t be here blogging about it if it hadn’t made some difference to me. Let’s meet the newest addition to my family: the pH prep toner! Mine is called Prep School. It’s a prototype from the lab of mad genius artisanal skincare formulator Chel of Holy Snails, and it goes perfectly with my Muji facial cottons. What are acid toners and what do they do? In person, Prep School reads a bit closer to 4 than to 3, which is perfect for this sort of thing. I’ve personally never found acid toners critical. The various L-ascorbic acid vitamin C serums I’ve used and my reliable COSRX AHA and BHA have always worked just fine for me as they are. Additionally, since I always use a low pH cleanser, I’m not concerned with lowering my skin’s pH after cleansing. So why, you may be wondering even harder now, did I decide to add an acid toner to my routine? Besides the fact that I’m always down to try anything Chel whips up? The answer is tretinoin. The Curology prescription tretinoin that I’ve been using for a few months now, to be exact. In my last Curology update, I talked about some of the things that my Curology provider and I agree have boosted my skin’s tolerance. I haven’t talked much about the things I’ve cut back on in the name of tolerance, though. If I were to use my vitamin C serum, AHA, and BHA daily as I used to, while also using prescription tretinoin daily, I have no doubt that my face would be a flaking, peeling, dehydrated, overexfoliated, oversensitive mess. I can’t have that. I dialed my use back to every other day to prevent this, but with my acid frequency halved, I started to notice some SFs creeping back onto my nose. My skin also started to seem a little more prone to clogging. Neither of these changes was major by any stretch of the imagination, but I noticed them, that’s for sure. It hasn’t been long at all since I introduced an acid toner into my every-other-day chemical exfoliation routine, but those little signs of trouble are already starting to go away. The reason why seems pretty simple. The acid toner gives my acids an extra kick. It’s enough to get my SFs and clogs back under control without exfoliating more than my skin can handle. I can’t review Prep School for a couple of reasons. One, it’s not actually available for sale, so there’s that. Two, I don’t have much to compare it to, having never consistently used any other acid toners in my routine. And three, Chel is my friend. What I can say is that I give a definite thumbs up to the idea of acid toners in general. If you’re looking for something to up the power of your actives without drastically increasing your chances of overexfoliation, a pH prep step may be a good one to explore. When I showed my current actives routine in my Snapchat (mommasharkus) the other night, it got screenshotted a few times, so I thought I’d share it here as well in case any of you guys are looking for examples. Since actives are designed to accelerate the removal of dead skin cells rather than to nourish the skin, I think of them as part of the cleansing portion of my routine. I do my non-prescription actives every other night and begin immediately after cleansing. Like any other active, L-ascorbic acid vitamin C works best on bare skin. 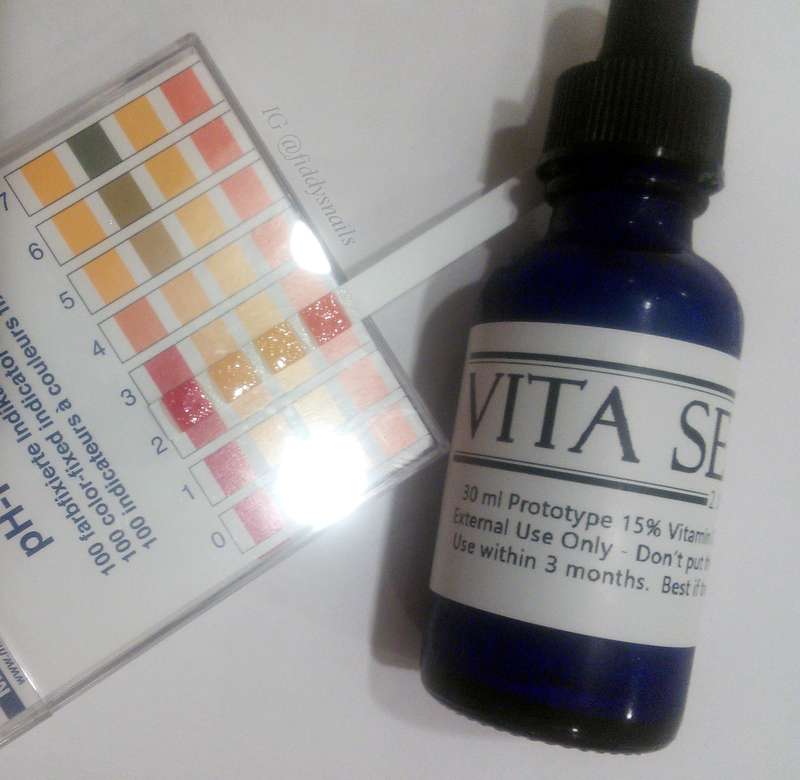 And the vitamin C serum I’m currently using, another Holy Snails prototype called Vita Sea, is at such a low pH already that I don’t see any need to boost it further. Therefore, I start my actives with Vita Sea. In person, it’s right around a 2.5. So very low and so very powerful. After applying my Vita Sea, I let it absorb for about 15-20 minutes. By the end of that wait period, my skin has taken on all of the brightening and anti-aging vitamin C goodness it’s going to. The rest is residue. Residue that may interfere with full efficacy of subsequent actives. Meanwhile, my skin’s pH has most likely risen a fair bit from the low point it reached. That’s where my acid toner comes in. I squirt some Prep School onto a facial cotton and swipe it over my face, clearing off any vitamin C serum residue while also bringing my skin’s pH back down a bit in preparation for my AHA. Getting to use my Muji facial cottons is just a bonus. I don’t know why, but I really like them. Acid toners don’t require a wait time (actually, that would be counterproductive, since you’re using them to lower your skin’s pH, which will start rising again if you wait), so after Prep School, I go straight to the next step. For me, that’s AHA. Generally, it’s advised to use your BHA before your AHA so that the oil-soluble BHA can cut through the gunk in pores and allow the water-soluble AHA to penetrate further. But then I thought really hard about it. Too hard, probably. To me, it would make just as much sense to use AHA first, so that the AHA can clear dead skin cells from the surface so that the BHA has less to get through. But then I remembered that acids at daily use concentrations don’t even work instantly. That made me more confused and my head started hurting and I started getting angry, so I decided to go with lower pH to higher, which is a good rule of thumb. With my COSRX acids, that puts my AHA before BHA. This works just fine for me. My AHA reads about around a 3.5 by my strips. 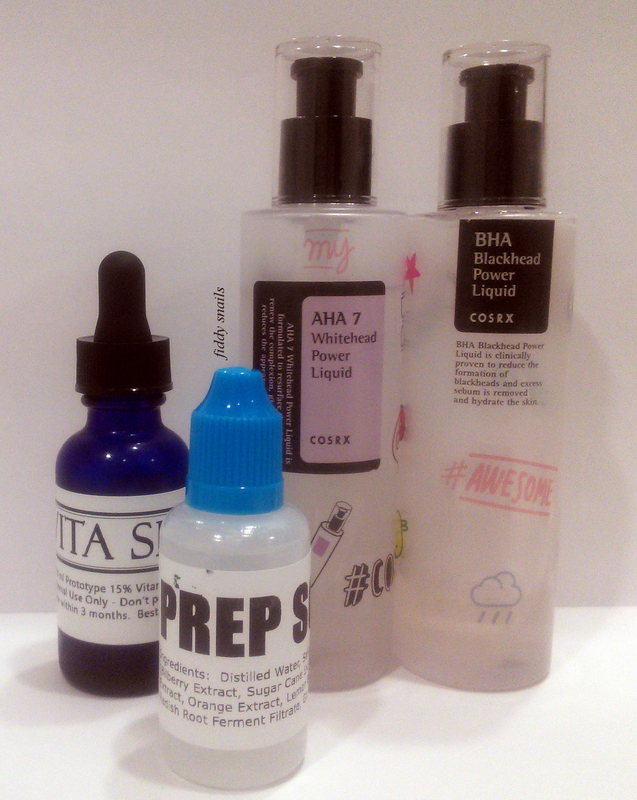 After giving my AHA about 10-15 minutes to do its thing, I move on to my final acid step, COSRX BHA Blackhead Power Liquid. I use facial cottons with this product as well in case I have any AHA residue left over. Best to have as clean a surface as possible given how many products I like to pile on after my actives. COSRX’s BHA is right around a 4 according to my strips. And that’s it! One more 10-15 minute wait time later, and I’m ready to move on to whatever else the evening has to offer. It’s one big happy acid family, and it will stay together as long as it continues keeping my pores clear and my skin smooth and bright. Do you use an acid toner? Which one and why, or why don’t you use one in your routine? I just purchased my first bottle of C20. How important is it to clear the vitamin C residue after the wait time? Is it only necessary if you will be using other actives after? If I don’t plan to use AHA/BHA after it, will non-acid toner suffice? It’s not important at all and I never did it before ☺Is just a little bonus step! Not that I don’t believe you, but I literally can’t tell about the pH based on those photos because of the glare from the box. Interesting food for thought, though. So since I’m not using actives every day (I’m every another day with AHA and vitamin C is still waiting for a few weeks to be introduced since I have sensitive combo-dry skin), having Cosrx AHA/BHA toner is not a waste of money 😀 ? (I got it before the actives) Sounds nice. Btw, if I did, let’s say, acid toner – AHA, would it make sense to add an hydrating toner afterwards? Or just jump to my usual serum? I don’t do the double-toner, just wondering. Yeah, I actually do do a hydrating toner as my first post-active step, usually Klairs Supple Preparation but sometimes Enprani Moistfull Booskin (which I normally save for the mornings, but if I’m in a rush it does cut a couple minutes off the evening routine as well). I like doing so because it moistens my skin back up to prepare it to receive the serums and stuff. hi i have been using bha before aha daily and i have noticed a little purge going on and dehydrated skin do you think switching aha before bha will help get rid off this issues? thanks! Purging has to be gotten through, but I don’t think switching the order of the products will help with dehydration, which suggests that you may be overexfoliating a little. I’d dial the acid use back in frequency and maybe look to see if your current routine is replenishing your skin barrier enough! Thanks for the post! This is super helpful as I was not really clear what is considered an acid toner so the names of a few helps. Is Son & Park Beauty Water an acid toner? The wait time in between all of the acids kills me in the morning, but it is so worth it. Glad to see the 10-15 in between the AHA & BHA + the switch up. I have skipped around between the 3 (vitamin c, AHA, & BHA) depending on my skin & so far so good. I love reading your posts as I’m still getting the hang of this. Hi Erin! I don’t have any direct experience with the Beauty Water, but based on the ingredients (it has willow bark extract, which is a natural variant of BHA though extremely gentle, and papain which is an enzyme exfoliant) it does sound like one! Is there any reason you use your acids in the morning rather than evening? Thanks for the response about the Beauty Water, I like Son & Park so I have been sticking with it. But Cosrx products has worked well so far so I might give their Clarifying Treatment Toner a try. I actually use acids twice a day if I can since my mug can handle it. But 80% of the time it’s vitamin c in the AM & BHA + AHA in the PM. Very informative blog……I am working on my acne scars (some pitted) on my combination skin……Vitamin c in morning and aha/bha with niacinamide essence in the evening. Is this fine for PIE? I always wear a sunscreen in the morning. Wher do I add Arbutin? This was a super helpful post! My only question is, there is a lot of information about the optimal pH for acids – is there an optimal pH for tretinoin/retinols, or do those just need to be close to the skin? Do you do this every night? Would your Curology medication be the next step afterward? This is every other night, followed by Curology, and on the other nights, I just wait 30 minutes after cleansing and then apply Curology, no other actives. Thanks for the reply! I’ve read on holy snails that the ascorbic acid (vitamin c) and niacinamide which contains in Curology counter each other and make them both useless. What do you think about this? Hi! Curology contains MAP, a stabilized and not pH-sensitive form of vitamin C; it has no negative interactions with niacinamide because it is not at a low enough pH to trigger the conversion into niacin which may cause flushing in some people. Were you thinking about her post on OST C20? As long as you leave about 15-20 minutes between your low pH product and your niacinamide containing product, you should be fine. Heck, neither C20 nor Cosrx BHA (which also has niacinamide) ever gave me a problem…only flushing I ever got from mixing niacinamide and low pH was when I mixed LJH Vita Propolis ampoule directly into my C21.5, which was my own mistake! I have been wondering that since I’m currently trying the Glow Tonic. I guess it made my skin look nicer than before, so I’m guessing I will just follow your step to it since I will be starting on vit C once it arrive. Thank you for the post, I find it very helpful. I see that you use cotton to apply the acid toner and BHA. Do you use cotton to apply AHA as well? Thanks for your response. I’ve been using the products in this order: acid toner- Vit C- BHA – AHA, and did not see any significant improvement on my face. I’ll try your way to see if it would make a difference to me. Happy holidays!!! Hi FIddy! Sorry I’m late to the party… I’ve used the following as ph-adjusting toners: p50W, p50 (no phenol), son and park, pixi glow tonic, bioderma, and cosrx aha/bha treatment toner. I am still experimenting with the regular p50 since it sometimes makes me a little itchy on the neck. The p50W was a dream, though, so I may switch back to that when my regular p50 is out. I use rx finacea (azaelic acid) in the morning and tret .05 % in the evening. Every other night I use cosrx AHA after my ph-adjusting toner. In the morning I sometimes use p50 by itself or will use a silk naturals vitamin C serum after. I am trying to wait for Vitamin Sea, but I’m pretty much out of any vitamin c, so will probably order silk naturals awesome sauce to tide me over. All of the SN serums I have tried use MAP instead of LAA, so I don’t worry so much about wait times, other than not wanting to pile more stuff on top of the serum-sticky phase. I used to try and tolerate the sticky, hot dog, fussyness of LAA, but I have decided it’s not worth the trouble since other actives and serums (including shark sauce) are working so beautifully. My only tricky active is BHA. I have used one sal. acid product or another (mostly over the counter) most of my teen/adult life, with no significantly visible results. While the type of acne I’ve had has changed over the years, it has always been present. Currently I have some combination of eczema/papule acne/perioral dermititis/possible rosacea around my mouth and chin that i’ve been working years to treat. AB products combined with rx products have been the first to make a dent. However, when I tried to add cosrx BHA power liquid or chico/chica BHA I had a terrible, lingering, itchy-burny flare up:( I am now slowly trying the BHA A-sol, which doesn’t seem to bother the area much. Where do you see improvement with BHA use? Mostly around the nose? Also, what is your reason for using vit C in the evening instead of under sunscreen? Thanks for your great posts, and hearing y’all in the podcast was wonderful:) Happy New Year! Like, OMG, this is what I asked on Reddit a couple months ago, but since I know nothing about nothing when it comes to all this chemist-talk, I was convinced that BHA -> AHA was the way to go. Now I am gonna try the AHA -> BHA tonight and see if I notice any difference in the long run. Do I have to wash off the aha before applying the bha? Nope, no need to wash off either! How do you use acid toner? With cotton pad or just spread them with hands? Cotton pad is my preferred method for cleansing-type toners like this one, hands for hydrating toners. Hello, reading your post is such an enlightment for me. I’m a newbie in the acids/chemical exfoliant world, and after reading so many good reviews about COSRX BHA blackhead power liquid, i finally bought it online. After i got it, out of curiosity and excitement, i tested it with PH strips i had at home (the strips are quite old indeed, i had it more than 5 years i think) and the result showed 6 not 4 like it should be (the result colours are very different from the one in your post). And so i thought my strips must be at fault since its so darn old, then i tested cooking vinegar with it… and the result quite true, it showed around 2-3. So what happenned with my BHA liquid then, i tested it again but the result still showed 5-6. Have you had any experience with things like this? Or is it possible the BHA is damaged from the shipping (i don’t know… exposed to heat or something maybe), or i’ve just got a bad bottle? I’m so confused. I did use it last night, it did calm down my redness and hydrate my skin, the 20 mins waiting time is quite pleasant without tightness or drying feeling at all. And this morning i noticed i’m shedding, dead skin layer peel off but no irritation or sting or redness. I wonder, is still safe to use? 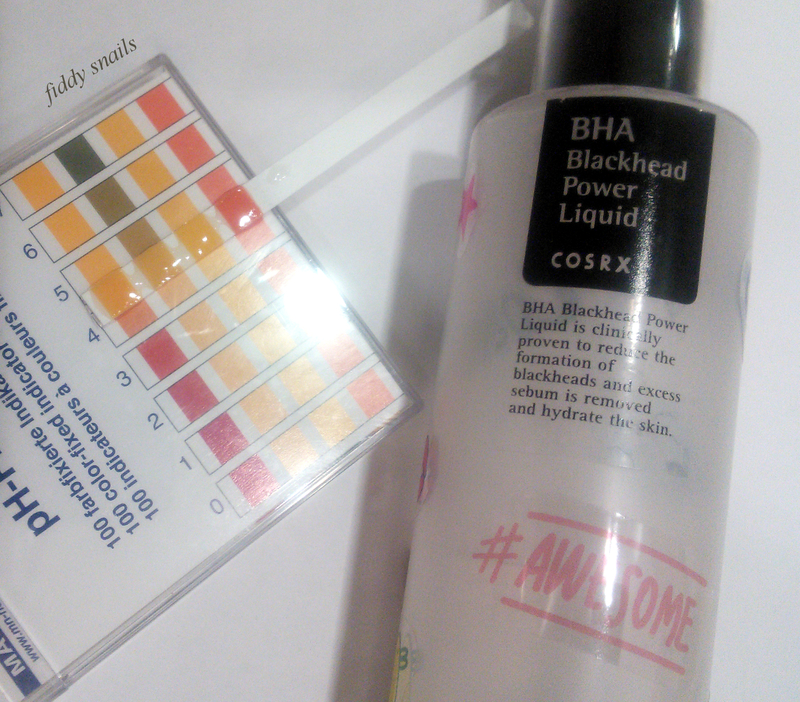 Moreover, does the BHA still works eventhough my ph strip test showed it was PH 5-6? Thank you so much for reading this, i’m so confused right now whether to continue using it or not. On the morning that I do the pore clearing routine that you have listed with BHA/ClayMask/Cleansing oil, should I skip actives that evening? I’ve read never to use Niacinamide and Vit C at the same time, but just want to confirm. Is it ok to use the P50 and then a Vit C serum? Hi! Your AHA/BHA toner, then vitamin C, then snail–but in my opinion, the formulation of the Klairs vitamin C serum will not be effective to lighten dark marks. Hi, I have pixi glow tonic, cosrx bha blackhead power liquid and ost vitamin c20 serum. What is this the right order to use them? Thank you!